Cool, say now we have a huge population with characteristics (Mu, Sigma^2). When doing a study by sampling, we take a random sample (size n items) and then perform the study on the sample and conclude results back for the population. Well, let's see a simple illustrating example: Suppose we have a population with mean Mu=100. What we see that the sample mean is usually close to real population mean, that is the meaning of the expected value of x_bar will be Mu. Regarding the variance of sample mean (x_bar), variance will always decrease as sample size increase (sample variance=Sigma^2/n) which is natural behavior. We may think of this as the larger sample size we use, we tend to have more precise values for population mean. When sample size goes to infinity (theoretically), the x_bar variance will be zero. The reason here is that the sample will be exactly the same as the population (all items). Thus, sample mean will give the real exact value for the population mean. 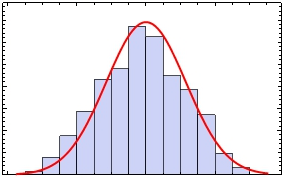 There will be no variability in the sample mean because the it fully represents the population mean.